So I bought a spiralizer forever ago, and stuffed it somewhere in my pantry and forgot all about it…until the other day! We have tons of squash and zucchini in our garden, and sautéing it with onions gets old. 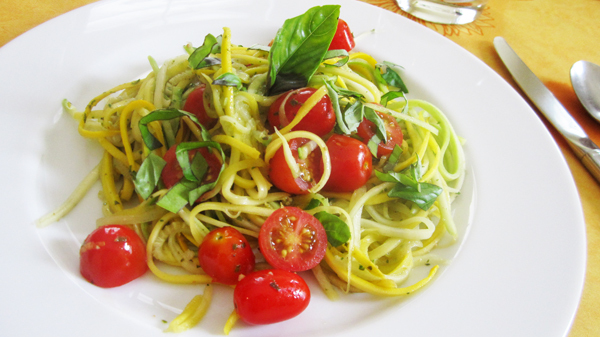 So far I’ve only tried this recipe (http://vegangela.com/2011/09/05/fresh-tomato-basil-and-lemon-zucchini-pasta/) twice and really like it because it’s fast, easy, and healthy. I see a TON of potential with this cool little kitchen toy and can’t wait to try some different things and experiment! In case you don’t have a spiralizer already, below is the link to the one I got (it’s pretty cheap). It’s simple to assemble, clean, and use. I imagine there are tons of different kinds on the market, but this one was basic enough to do the trick! Previous Post Want to Change Your Life? I’m totally trying this one!